Andreessen Horowitz’s general partner Chris Dixon will join BuzzFeed’s board of directors and co-founder Kenneth Lerer will become executive chairman. 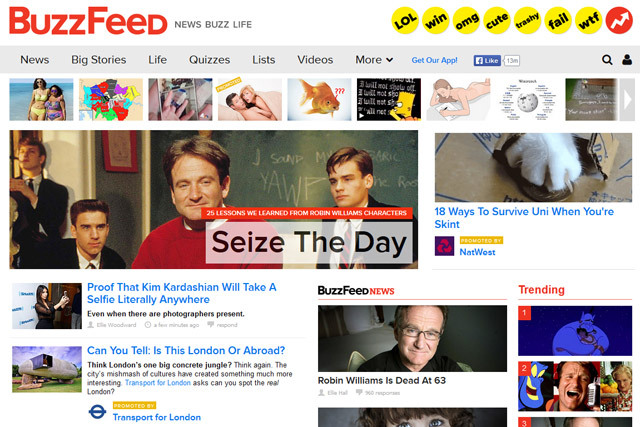 BuzzFeed will use the money to launch sites in Berlin, Mexico City, Mumbai and Tokyo this year. The company is planning to roll out new products for advertisers. It will centralise its existing team of 60 creatives and 15 branded-video producers in a division called BuzzFeed Creative, overseen by recently appointed president, Greg Coleman. The company’s editorial team will be split into three divisions: news, life and team (which covers web culture). All three will report to editor-in-chief, Ben Smith. It is also launching a 20–strong social media team called BuzzFeed Distributed, which will focus on producing content specifically for social media sites such as Tumblr, Imgur, Instagram, Snapchat, Vine and messaging apps. The company will rename its video unit as BuzzFeed Motion Pictures, and will start producing longer-form video alongside its existing short-form video content. It will explore longer serialised content that will build characters.